He first appears in Buddhist manuscripts in the early 7th century, described as being one of the most powerful Tantrics in tibetan history, summoned to Tibet by the King Trisong Detsen to propagate the Buddhist religion in Tibet. It is him that built the Samye Monastery. He is revered in India, Tibet and Nepal as being the master of Tantras the fundamental texts in the Vajrayana tradition. 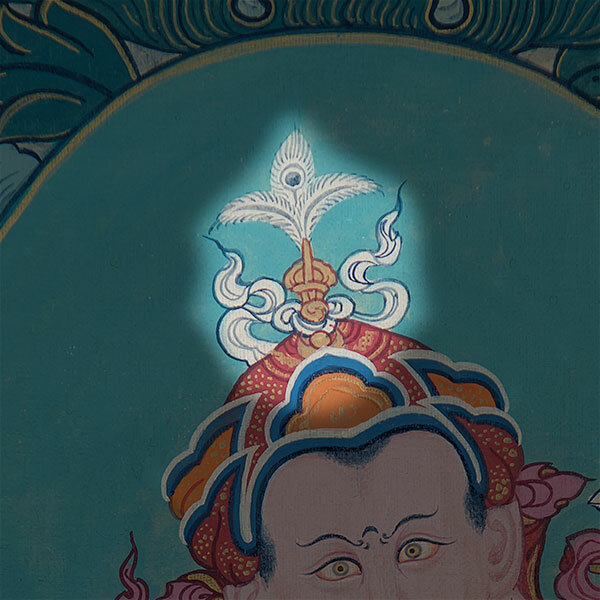 His name Padmasambhava, was given to him as legend has it that he was found as a young child, 8 years of age, in the heart of a lotus on the Dhanakosha lake in the kingdom of Oddiyana (actually the region of kashmir). His entire existence is filled with miraculous feats accomplished in India, Bhutan, Nepal and Tibet. Each of his forms correspond to the different episodes of his life that spanned over 200 years according to legend. His eight forms are ; Shakya Sengue, Pema Gyalpo, Padmasambhava, Dorje Drolo,Nyima Oser,Padmakara, Sengue Dradrok, Loden Tchokse. 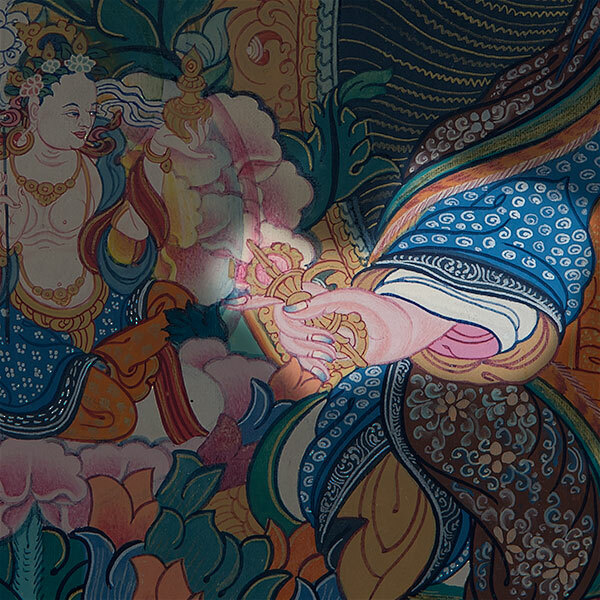 Believed to reside in the Glorious Copper Mountain, a thangka that usually represents him in his eight forms surrounded by dakas and dakinis dancing and feasting. 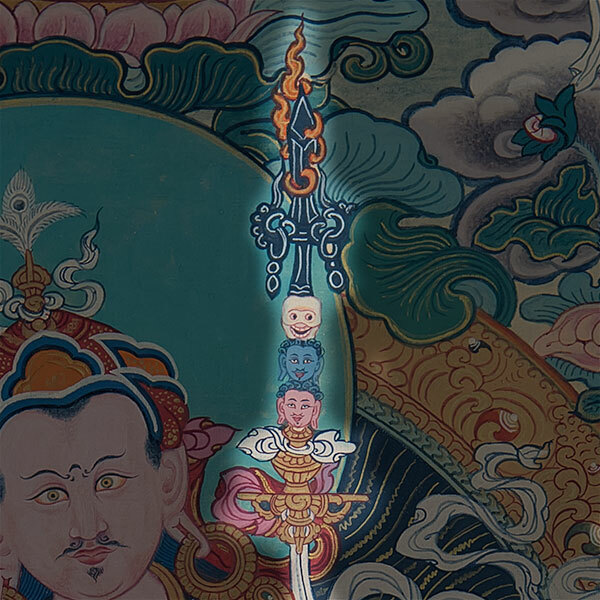 Another popular Thangka will display him with his 25 greatest disciples, amongst which you will find the King Trisong Detsen and one of his servants. According to legend he is said to have trusted these disciple with the task of hiding certain sacred texts and treasures that will be discovered by their incarnations at the opportune moment. The common form is Padmakara “Lotus Born”. This form and its attributes are a symbolic representation of his many accomplishments and powers. 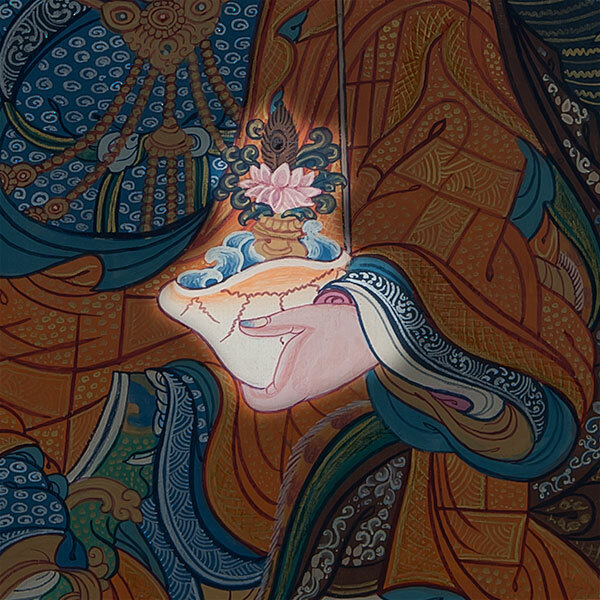 The shape of his hat in the form of a five petal lotus, allows us to understand that he belongs to the lotus family of Amitabha. He is indeed an incarnation of Amitabha.